I've been invited to be a guest blogger at the very excellent site of agent Rachelle Gardner on Thursday. Drop by and see what words of wisdom I've posted there. Thanks. What's Around The Bend Of The Road? I didn't set out to become a writer. I'd had a very successful career as a physician: clinician, researcher, educator. Now it was time to retire--enjoy life, travel, play more golf. But things don't always work out the way we plan them to. My wife of forty years had a fatal stroke two weeks after her retirement. I had planned to retire right after she did. Instead, after sustaining that loss, I stayed on at the medical school for three more years before stepping down. In the intervening time, God had blessed me with the love of another wonderful woman, and this time I was determined to enjoy my "declining years." There was some travel, some speaking, a bit of golf. But I also began writing. For two years after Cynthia's death I had journaled, using emails and notes to chronicle my journey through the minefield of grief. One of my friends read those raw journalings and was so touched by them that he urged me to publish them. Of course, I hadn't the faintest idea how to go about it. Fast forward a couple of years, to a Christian writers' conference, where caring professionals began what has been an ongoing education for me in the business--and yes, Virginia, it is a business--of publishing. Finally, seven years after Cynthia's death, my book, The Tender Scar: Life After The Death Of A Spouse was published. So that was it. I'd had a non-fiction book published. But the story didn't end there. A well-known writer at that conference was impressed with my ability to "put the words together," so he introduced me to an editor. The editor, in turn, challenged me to try my hand at fiction. He even told me what he'd like to see--a novel about a former baseball player turned doctor. The resulting novel made it as far as the pub board at his house before being turned down, but that was enough to get me interested. I felt God nudging me toward more writing. After that came numerous meditations and article in various periodicals, most often the devotional guide, Upper Room, but I was also writing novels, none of which met with any success when I shopped them to editors. I even acquired an agent, but that didn't seem to help. By the time I'd finished my fourth novel, I was bathed in self-doubt. I prayed long and hard, and had decided to put aside my writing for good. Then an agent, Rachelle Gardner, held a contest on her blog , seeking the best opening line for a novel. I won that contest with this line: "Things were going along just fine until the miracle fouled up everything." The first prize was a critique of the first few pages of a novel. I submitted the opening from my most recent work, and Rachelle's critique went something like this: "Send me something that needs editing." Rachelle is a former editor, now an agent, and she liked my work. Maybe I shouldn't quit. At least, not yet. More praying. More deliberation. And I began writing again. The last chapter in this saga hasn't been written. None of my novels has been picked up yet, but this week I got a notice that another of my articles has been accepted. Apparently I'm doing something right. So I guess I'll keep on going down this road. Why do I post this? Writers need encouragement. If you're about to quit, think again. Pray about it. Maybe you're on the brink of something good. I hope so. I first "met" Kristy Dykes via the Internet. I can't recall the exact reason, but we wound up exchanging emails and comments on each other's blogs. 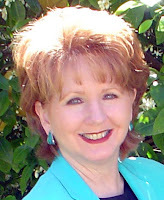 Then I decided to do some "all-redhead, all-the-time" author interviews, and Kristy was one of the first people I asked. We ran into each other a number of times at conferences, and even when she was surrounded by friends she'd see me and call, "Hello, Dr. Richard." I could never convince her that I was just plain "Richard." It had to be "Dr. Richard." Now I cherish that title. Her emails always began with "Greetings from Sunny Florida." Her smile could light up any room. And she always had a kind word for her "hero," her husband Milton. I know how important the support of a spouse is, and Milton filled that role in spades. When we learned that Kristy had been diagnosed with a very aggressive form of malignant brain tumor, it was like one of our own family had been stricken. Kristy chronicled her journey in her blog, and when she was no longer able to do that, Milton took over and kept us informed. I am painfully aware of what it means to lose a wife, to sit at a bedside when hope is all but gone, and I can empathize with Milton in his loss. Over a year ago, I sent Kristy a copy of my book, The Tender Scar: Life After The Death Of A Spouse for Milton to use when counseling church members who had lost a loved one. I was pleased when she told me how much she liked the writing. Although none of us had any idea it would be so applicable to his own situation, I'm glad he has it. I hope it ministers to him. Kristy Dykes has gone home to be with God. For details, consult her blog that her loving husband, Milton, has maintained during her fight with a glioblastoma multiforme brain tumor. Kristy was an icon in Christian writing. Now she has fought the good fight, has run the race, and today she is healed and home. Please remember the family in your prayers. This image, from a site featuring numerous old photos, illustrates the way most writers feel--especially if they have a life of any sorts. We teeter on the brink of catastrophe at times, wondering how it got this crazy. Career writers are caught between Scylla and Charybdis (for those of you who recall your Greek mythology), either wondering when (and if) the next contract will come through or writing furiously to meet deadlines. Those of us who try to carve out time for our writing amidst our other responsibilities--job, family, church--sometimes find ourselves going for disturbingly long periods of time without adding to our product. Life sort of gets in the way, doesn't it? I've been reminded of this recently as family responsibilities demanded my attention, to the detriment of my writing. The blogs of a couple of my writer friends have echoed the same problem. We have to prioritize, and sometimes what gets pushed aside is our writing. And when this happens, guilt begins to creep in. For many of us who write, our writing is as natural and as necessary as our breathing. If we can sneak a few minutes to bang out a hundred or so words, it helps. On the other hand, if it frustrates you that right in the middle of an intense scene you have to break up a fight between the kids or clean up after the puppy, maybe a writing break isn't the best thing for you right now. However you handle it, realize that you're not the only one doing a balancing act right now. But this, too will pass, and so long as we lean on God we'll get through. He's the ultimate safety net. As we continue the dance of "Can we sell this house? Can we find another?" I'm struck by how many of the pitfalls along the way remind me of similar frustrations and disappointments in my writing career. Here's another example. We've actually found two houses that we really like. We made offers--negotiated in good faith--only to have the negotiations fizzle for various reasons, none of them having to do with us. So the search continues. Ever make contact with an editor or an agent and think there was a real connection there? You send your proposal, get a request for a full manuscript, and then you wait. Sometimes you get a pass letter and your heart sinks, but instead of that you may receive a communication asking you to make some revisions and resubmit. The connection is still there, you feel the tingle of something in the offing. You do the work, make the revisions, and wait some more. Then you get the word that things just aren't working out. Maybe this comes as a phone call or an email instead of the boilerplate letter, but it still hurts. So you stamp your foot, maybe say a few choice words, possibly go on a chocolate binge. Eventually, pain and resentment are replaced by a spirit of soldiering on, so you get back to work and keep trying. We believe we'll find the house we want. And those of you who are serious about your writing believe you will find the agent or editor you want. Meanwhile, back to work. Because persistence and determination are important...in house-hunting and in writing. All of us who write have agonized over getting someone to "buy" our writing, whether it's a novel, a non-fiction work, or a piece for a periodical. It's struck me recently that what we're doing bears a strong resemblance to the process involved in the buying and selling of a house. 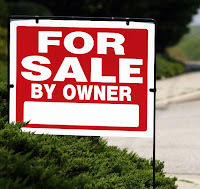 Years ago, to consider buying a house you cruised the neighborhood you had in mind, watched for signs in the yard, jotted down the phone numbers, called the listing agent, made an appointment, viewed the property, and moved on to the next before making up your mind. Now you log on to the web site of your favorite realtor and through the magic of the Multiple Listing Service you're able to view properties that fit your needs and desires. You can see pictures, read about features, winnow out all but the best prospects. Then, when you're ready to actually start doing a walk-through, you're pretty sure you're looking in the right place. Now imagine you're trying to sell your writing. Let's say it's a novel and you want an agent. You check out the agent's web site and see what he/she represents. Oh, many of them say they do it all, but if you dig deeper you can find that they have certain genres, certain types of writing that incite a passion in them. When you find someone whose passion matches your writing, that's a good place to start. The same thing can be said of editors and publishing houses. I have a friend who is an editor at a well-known Christian publisher. He's given me an open invitation to submit my novels to him, promising to consider them. But his house doesn't publish "medical suspense with heart," which happens to be what I've been writing since I decided where my talent and interest lie. So I don't bother him with submissions. On the other hand, there's another editor who referred me to the writing of a well-known author of medical suspense and said, "That's what I envision you writing." Do you think he's going to get my next submission? Bet your boots. The analogy can be carried further, but I think you get the picture. Do your homework before submitting. It will pay off in the long run. Enough for now. I need to get back online and check some more houses. Have you ever spent what seemed like an hour agonizing to find the right word? You know what you want to say, but you'd like a synonym that says it better or fits your need. For example, I'm working furiously to make a few last-minute revisions in my proposal for my latest novel so my agent can pitch it to some editors at the ICRS. One of the things she asked me to do was to come up with a new title and several alternates. Any of you who've done that know that it's not exactly easy. You want something that catches the tone of the work, something that will grab the eye of an editor (or, if things go well, a reader). That's when I reached for my Flip Dictionary. I first encountered this volume when David Talbott held it up one lunchtime at the Mount Hermon Christian Writers Conference, told a bit about it, and gave away a copy to somebody who qualified in whatever category he happened to choose that day--the person who'd come the furthest to the conference or some such. It sounded like such a great tool I immediately hotfooted it to the bookstore and bought one. Since then, it's the only writing book that sits on my desk instead of residing in my bookshelves. I use it often, and it helps. Let me give you an example. Suppose you're looking for a way to say someone has eaten and/or drunk to excess. You turn to "full of food or drink" and you find "replete, sated, satiated." Or maybe you're looking for a military term and don't know exactly how to phrase the search. There's a long list of "military terms" and you find that the word you want to describe an aircraft mission is "sortie." In my case, I was looking for some synonyms that would work in a short, punchy title. 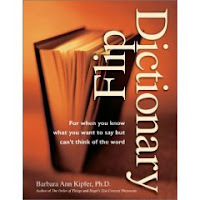 I won't reveal what I came up with, but sufficient to say my Flip Dictionary came through again. Now it's back to work. If it's this stressful just revising a proposal under deadline, I can't imagine how tough it is to try to finish and polish a novel in that situation. But I hope to find out someday. On July 4, 1976, while America was observing its bicentennial, I sat in the Windows on the World restaurant atop the North Tower of the World Trade Center and watched fireworks light up the New York night. Slightly more than a quarter of a century later, I stood transfixed in front of an appliance store window in downtown Denver and watched in horror repeated showings of that building being destroyed by a plane commandeered by terrorists in a suicide mission. I knew then, and I still believe, that our world will never be the same after 9/11. One change of which I heartily approve is the practice major league baseball instituted after 9/11. I grew up singing along with the crowd during the seventh inning stretch, Take Me Out To The Ballgame. Now, we pause to honor America and sing words penned seven decades ago by Irving Berlin, a song that has had deep meaning for Americans through a world war and the numerous conflicts that followed. Now, more than ever, it should be the prayer of every American: God Bless America. Fly your flag this weekend. And the next time you hear the song, sing the words as though you mean them. Early in my medical training, I noticed a large sign over the desk of a physician who was in charge of one department of the medical center. It read "TANSTAFL." When I asked him about it, he told me it was to remind him to be dubious when it appeared he was about to get something for nothing. "There ain't no such thing as free lunch." I've tried to keep that in mind over the years, but today I'm happy to announce that there is a free lunch. And I recommend it for all writers. Publishers Market Place puts out a daily bulletin called Publishers Lunch. There is a paid version of it, but the free version has a lot of worthwhile information and material. You can sign up for it using this link. And for someone who's really serious, check out the tab to subscribe to the full Publishers Lunch. At the forthcoming American Christian Fiction Writers meeting, I'll be taking a course that involves "high concept." This is something that's been around for quite a while, mainly in the area of movies, but novelists are finally catching on as well. Part of high concept is developing a single sentence that conveys the whole idea of the work. And a recent issue of Publishers Lunch (the free version) had several good examples of such a sentence as it listed the week's "deals"--contracts signed. Here are a couple. "Screenwriter Attica Locke's debut novel BAYOU CITY, about a former civil rights attorney who becomes the target of murder investigation after saving the life of a drowning woman, to Dawn Davis at Amistad, for two books, in a pre-empt, by Richard Abate at Endeavor (world English)." Get the idea? I read these every week just to learn more about writing these one-sentence characterizations. I also enjoy reading the publishing news, some of the rumors and hints of change in the industry. It's another way of getting an inside look, and I hope you find it helpful.